EventID 4226: TCP/IP has reached the security limit imposed on the number of concurrent TCP connect attempts. This limit can slow down your internet access specially Peer-2-Peer applications like BitTorrent which require connecting to several peers for optimal performance, to increase this limit for speedy torrent downloading you need to patch the Windows TCP/IP system driver file, If your have already patched your TCPIP.sys file and updated your computer to Windows XP Service Pack 3, you should re-patch it using the free TCP/IP patcher for Windows XP. so what does this do? boost my overall internet speed or just torrent downloads? If you are making more then 10 connections at a time this should theortically increase the speed, I have personally seen good torrent speeds after applying the patch, there is no harm in trying. I just tried it and I totally saw a huge change in my speed! Simply download the patch to Desktop and launch it, enter the new TCP/IP connection limit and click Apply to Patch. tally 7.2 data migrate to tally 9. patch is not working.pls advice me what can i do ? its very urgent. This is pc tcp ip limit extender.This has nothing to do with speed of your pc, speed depends on yor internet service provider. TCP/IP patcher is useful who extract socks proxies and for testing for socks proxies via softwares. My Nod32 says there is a virus in this file! It doesn't seem to work with Windows Server 2003 Datacenter Edition. This limitation is property of XP Workstation! You dont need a patch for Windows Server OS's because if they are limited, not many people can connect to it. This Does not seam to work. when i run the patch it says it was successful and when i try to connect more then 10 computers in the lap to the patched computer they error out saying that the connections are maxed. any ideas? DO NOT TRY EVRYTHING YOU SEE IN THE INTERNET! This is an advice to my dear friends; do not try everything you see in the internet. Most of these so called tricks won't help you at all. In fact if you try these things you're situation might turn a lot worse or maybe total disaster. The speed of your internet actually depends on your ISP and the bandwidth that they had allocated for you. So there’s no point in changing the settings of you computer. Just let the default settings as they are because they are set to those values for a fair reason. But if you really think tweaking settings could help you, get some advices from a professional. You should not follow every trick on internet but this one DOES work particularly if you use torrents and other similar P2P applications, from common sense you can tell that Windows is blocking more then 10 connections and even reporting that in Eventlog so increasing more connections will make full use of bandwidth provided by your ISP. I agree with fatboy 69, your tryin too hard to sound smart and you dont even know what your talking about. I bet you havent even tried the patch yet otherwise you would'nt have wrote what you just said. I'm working for a software compagny and we are facing a big problem with XP2/XP3 10x connections. By the way Thx for this patch we solved a lot of problems with it. for ex: with our software when you start it you use 8 connections / sockets so very close to 10x !!!!! each connection have life time when close it of 10 sec, so its the reason why you have this error message "You r... the limit of"
so we solve this problem to increase by 50 connections, tested and its working fine. Don't use a "patch" for something like this, it's asking for trouble! ...while if you "Set it yourself", you know what you did, AND you can try different settings until you find the one that's best for YOUR particular machine! It's no wonder that there were so many diferent people yelling "Virus!" when they tried it, although I didn't try it myself, because my machines have already been "optimized" for my set-up, and because I KNOW better! ...And to the person who said "You start the machine and it opens 8...(connections)? Sounds like there's something major wrong..."
You see, each & every thing that the machine's "basic brain bus" has to "talk to" needs at least one or two channels for EACH thing it's going to send or get info to & from, so after you've "been under the hood" of computers for awhile, you start getting like me - amazed that anything higher than an old 4.77-MHz XT-Class machine could start & run with only 8 'channels' open! Anything to do with setting your ports to help P2P speeds will be machine-specific, so you'll need to try several sets of settings before you find what works best for you, but personally, I'd NEVER trust a "patch", (read: "Script"), to mess with something so low-level as my TCP/IP settings, without my knowing what's going on, or at least, having it print (or save to a text-file) what the settings WERE, & what it changed them TO. Now, let's see just how many of these "internal connections" a machine needs to have, in order to get some very basic operating abilities, ok? ...Wow, do YOU have a LOT of things running that you probably don't even KNOW about! See how fast we got up to well over 80, which is over 10 times the 8 you say is "way bad"? ...I shudder to think of keeping track of all of those 1's & 0's in just a single 64-bit instruction or address! The "Pentium" was "named" instead of "numbered" because, for one of many reasons I'm sure, Intel got tired of the "clone"-makers using their chip-numbers, (which can't really be copyrighted), and went to a name, (after the "486", the next would've been "586" and "5"="Penta", hence the "Pentium", a name, (which CAN be copyrighted, and was!). As various other people have already mentioned, no, you shouldn't rely on alot of things you see on the net. Yes, this particular tweak does work. You'll notice websites coming up much faster in your browser after applying it. I wondered why my Internet was so slow after applying SP3. I ran this program (yes, you shouldn't run strange programs you see on the Net as a rule, etc) and it cleared up my issues. Now everything is back to working smooth. this program will not affect download or internet speeds per se. it fixes a problem where SOME users will reach the security limit of 10 half open TCP connections. you can easily check if this problem affects you by having a look in the system event log (right click on "my computer", go to "manage" then open "event viewer" and choose "system" log). if you are reaching the default security limit, you will see an entry "TCPIP" with the ID of 4226. double click this to open it, and you will see the error message "TCP/IP has reached the security limit imposed on the number of concurrent TCP connect attempts." ONLY if you can find this error message will the above patch help you. mostly only P2P and torrent software will reach this limit anyway. if you don't see this error message, then you are not reaching the limit, so there's no point in increasing this limit. also, there is nothing that can harm your system by changing this limit. it was a "new feature" in service pack 1 - it didn't even exist prior to that - and was introduced to slow down the spread of worms which commonly open many hundreds of TCP connections at once. unfortunately some (mainly P2P) programs also open many TCP connections at once, and these programs are affected by this limit. and the above poster who claims his download speeds became worse after applying this patch likely has a worm or trojan running that he/she is unaware of, which is now allowed to make a higher number of connections and so use up more bandwidth. there's no way that increasing this value can by itself slow down your connection (and the only way that it could slow down your connection is if you decreased this limit to something even lower than 10). in any case, a better version of this patch can be found at the website www.lvllord.de, that guy wrote the original version and that one seems to work in more cases than the one posted here. Thanks for provding an alternate TCP/IP patcher ( not saying theres anything wrong with theone on this website ). Your one of the few people who know what there on about ;) Incredible how much utter nonsense people have been posting about alternative solutions when they dont understand what this patch does and why and then demonstrate to everyone else just what little they know in pages worth of rank amateur babble. will this trick work on windows 7 too? This is for XP SP3, not XP SP2. Anonymous wrote, "in any case, a better version of this patch can be found at the website www.lvllord.de, that guy wrote the original version and that one seems to work in more cases than the one posted here." Yes, most of us tried that before coming here. But SP2 and SP3 have different TCPIP.sys files. LVLLord's patch was for XP SP2, and it will crash an XP SP3 system. Also, attempting to mod "0A 00 00 00" to "00 00 0A 00" in the SP3 TCPIP.sys file doesn't work either. Dunno why... it just fails. So, if the patch here works for you, go for it. If LVLLord's patch works for you, more power 2ya. But don't mix them up. I've been really impressed with this site! Good Luck! Since August 2009 web pages were loaded after 20 seconds upto 2 minutes. MS fixit 50199 of the TCP/IP stack sometimes solved the problem for some period of time. I intended to buy a new computer (I have a P3, 550 Mhz, 512 MB RAM). However after running this TCP/IP patch both connecting to web pages and email server is very fast again. I think MS tries to push older XP versions out of the market in favor of windows 7! All I know is my internet is flying after using this patch! AWESOME! When i try to run it, a pop up says "windows does not need a patch" how can I get around this? There's another class of software that needs this patch. Most people talking about it talk about P2P. Proxy servers are however very common in home and corp networks, and it's not uncommon to be run on XP. In fact for our product WinGate, about 50% of installs are on XP. We recommend this patch very often for people experiencing this particular problem. The fact that a windows event log is written when this problem occurs means you can be certain if you are experiencing this problem or not. This problem causes real difficulties for proxies, who are opening connections on behalf of clients, and so can easily be opening many connections at any time (and therefore have 10 half-open connections). Note that the problem is only a limitation of HALF-open connections. This is not a limitation of total connections (which you can set in windows tcpip registry settings). HALF-open connections were singled out by MS because in their (IMO misguided) view, this was more likely to be happening when you have some malware opening lots of connections to spread viruses. A half-open connection differs from a fully-open connection. With TCP 3-way handshake, a half open connection is one where the initial (SYN) packet has been sent by your computer (to request a connection) but not acknowledged (SYN ACK packet) by the server. Note that ONLY XP suffers from this. The person who tried it on 2003 will not benefit. 2003 does not have a limit on half-open connections. Maybe they want us to buy server OSes. Also it was introduced in SP2 not SP1. Count one more "Thank you' for this patch. Working on XP SP3 even with latest patches up-to-this date nov.2011. how do I figure out my limit (i.e. change limit to____"
I guarantee this works. I was pissed for hours trying to figure out why the Service Pack 3 totally screwed my internet connection. I did a half a days searching and was VERY CLOSE to uninstalling XP SP3 when I found this post. My internet is much faster now. My issue was that FileZilla and FF, IE, Safari was so slow I could not get any work completed. As a web designer I was spending 1/2 my time trying to get FileZilla to upload files to the client domain and it just took for freakin ever. Use this tool, set it to 256 and you are golden. This happened-After installing this patcher my internet speed slowed....How do i remove it? It is not being displayed in control panel => Add remove programs...What's the other method of removing it? Transmission Control Protocol/Internet Protocol (TCP/IP) is the most popular network protocol, and the basis for the Internet. Its routing capabilities provide maximum flexibility in an enterprise-wide network. In Windows XP TCP/IP is automatically installed. Do not need any patch! 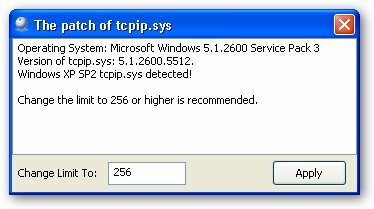 TCPIP.SYS needs a patch! Because Windows limit to 10 conections. The megaleecher xp sp3 patcher not working on windows xp sp3 hungarian version. Thx a lot .... this helped me a lot for performance testing. does this patch work on win 7??? No Dumb_Ass, it is for XP SP3!